On a few occasions when our little group of twenty or thirty foreigners got together in the university guesthouse for a potluck dinner, we listened to an accomplished songwriter and singer of traditional British, European and Appalachian folk songs. Here she talks about performing English-language folk songs in China and her experience with traditional Nanguan music, which is also called Nanyin. I was hired by the American Embassy to give concerts. In April they gave me a trial run in Shanghai which consisted of three performances. I played at the music conservatory, at the Foreign Language Institute and at the American Consulate. The last one was the most interesting for me, because I was better prepared and the whole situation was better. They invited about fifty people, the top people in Shanghai culture and education and people having something to do with America. The concert was held in the living room of the consulate, which is one of the three or four really beautiful rooms in the building. They brought in a piano, and I had my guitar and dulcimer. I also had a good interpreter. I explained each song before I sang it, and they listened to every word. It was good to have such a responsive group of people. They laughed and joked, and I had about three or four encores. Afterwards they had a reception. Some of the musicians were really interested in the dulcimer. They’d never seen one before. That was in contrast to my first concert at the music conservatory. Due to the weather, I’d waited seven hours for an airplane the day before, but I couldn’t get out until a few hours before the concert. I had Carrie, my two-year-old, with me too. I was exhausted when I got there. I got off the airplane, into the car, changed the strings on my guitar at the consulate, washed my face and got taken to the concert hall. I tried to figure out the sound system, but it was really a mess, and there wasn’t time to work out the kinks. I hadn’t given a real concert since last spring so I was very nervous. I was tired, and I hadn’t had time to prepare myself properly. The hall was huge. They had sold eight hundred tickets. Some of the people in the audience thought a string quartet was going to be playing. It was very dark. I couldn’t see anybody. I didn’t know whether they could see me. There was a guy translating for me, but it was just off the cuff, and he didn’t speak very good English. People talked, which is Chinese, but since I couldn’t see anybody or tell how they were responding, it really made me nervous. During the dulcimer set, the vocal controls were all screwed up, but I had no monitor so I couldn’t tell. I know there were some good moments, but I felt it didn’t go very well. People said they really liked it, though, and they invited me to come back. The second night I went to the Foreign Language Institute. That was in a smallish auditorium, about three or four hundred people. I asked them to keep the lights on. Most of the students could speak English, so they said I didn’t need an interpreter, I could just speak directly to them. They were just great. I sang John Prine songs, and they got the jokes, they were laughing in all the right places. Throughout the evening as I was singing, I realized how much American music—my own as well as other people’s—was about individualism and about love. Chinese popular music isn’t, or perhaps it’s just becoming that. I really felt as if I was putting forth a statement about American culture, that the evening was sort of an introduction to the obsessions, or the themes, of American pop music. I had a similar experience at a college in Taiwan when I could see the audience. When I first started giving concerts in Taiwan, I would begin by saying, “I have some Irish and English and Scotch ballads.” I showed them the differences. But they all sounded the same to them. So I have to be careful not to do “Willie of Winesburg” next to “Johnny and the Shoemaker.” They think both are pretty, but they haven’t any senses that they’re different songs, especially if they don’t know the stories and they can’t catch the words. Personally, my favorite audience to perform for was students who were studying English, because the students in China are really enthusiastic about hearing Western music, and the English students understand and get the jokes. The older Chinese people who’ve never heard Western music are usually not interested in it. It’s a big problem for me unless the audience is a special group. They might want to hear one or two Western songs they’ve heard before, like ‘Old Susanna,’ but they get bored really fast. They’re just not interested and haven’t got the ear for anything new. There are basically two categories of traditional music in Fujian or Minnan [South of the Min River, or Fujian]. In addition to the local opera, there’s Nanguan, a type of court music used for almost every occasion, for rituals, in funerals, as entertainment in a longer festival. It also had an opera form once. Nanguan is a very old musical form which dates back five hundred years. The music is sung, and it’s also instrumental. The songs are something like the medieval Provencal troubadour songs. Like the troubadour songs, Nanguan often expressed sorrow. It’s a very interesting, rather abstract music, very slow, very loud. It can be very expressive—really stunning. Great music for a good tenor. 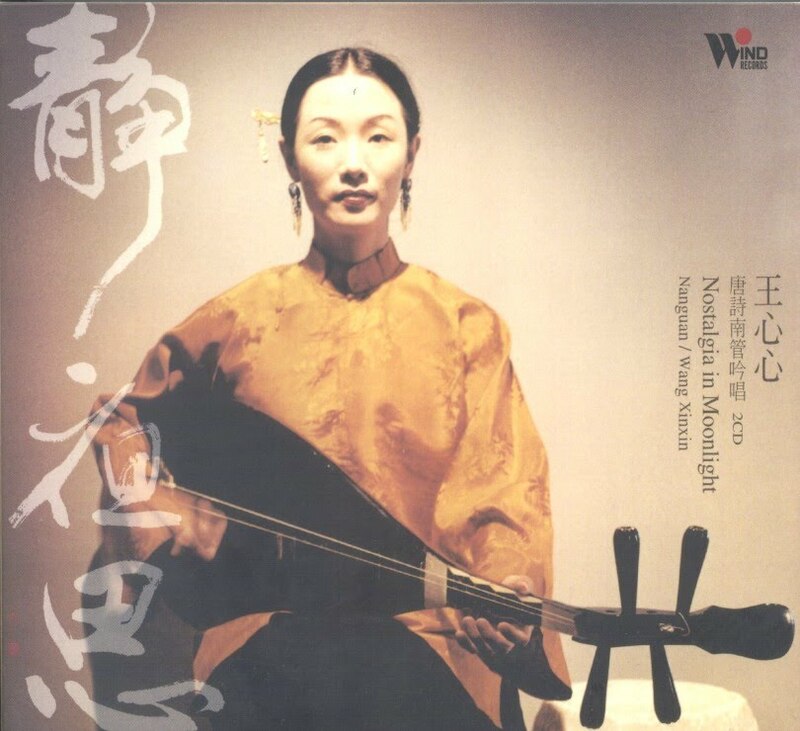 The four major instruments in Nanguan are a flat and hollow-sounding version of the Chinese lute which is held horizontally, a Chinese violin, the long Japanese bamboo flute or the side-flute, and a sort of snake-skinned banjo with three strings. There’s also the two-stringed bowed instrument held on the knee, and then there are all kinds of percussion instruments. The distinctive feature in Nanguan music is the singer, who holds the group together by keeping time with her clapper, which is made of three or four heavy wooden boards that are bound together at the top. The old-style singers, who are really the best, I think, hit the clapper very hard, very emphatically. All of the Nanguan instruments also appear in the Minnan opera, which is the other category of Minnan music. Ten years ago, when I first heard Chinese singing, I thought, “God, I’ll never understand this.” I really hated it. It is the completely opposite of the operatic booming technique of the West—more piercing and high. If you listen to a lot of traditional folk music sung in Ireland, Scotland, Yugoslavia, places like that, you find similarities in the sound, although the Chinese form is not a folk form, but a highly refined, trained vocalization. It fits with the tonal language. Minnan language [spoken in Fujian and Taiwan] sounds beautiful when it’s sung this way, so I think the sounds of the music were influenced by the sound of the language. The sound is produced in the upper part of the head, a higher part of the throat, and I think it was designed, like the shout-singing in Yugoslavia, to travel long distances without a microphone. It does travel really well, which may be connected with the fact that these events are always performed outdoors. If you listen to enough of it, you develop an ear for good singing. In fact, I have learned to sing some myself, but it’s very hard to learn a Nanguan song. I have a tape of very old people singing the Minnan folk music of Taiwan, which is dying out. There’s an old blind man on the tape—he’s now dead—and it’s amazing how much it sounds like an old black blues singer from Louisiana. The language is definitely Minnanhua, but otherwise you could be listening to Leadbelly. Traditional music was suppressed during the Cultural Revolution. It’s made quite a comeback, and now the government supports it. For example, there are the Nanguan music groups in Quanzhou, the center of the Nanguan tradition, and the music festival that was held there. But the young people, particularly educated young people, have never learned much about Chinese traditions. They’ve only heard “disco” [Western-style popular music in general]. They’ve only heard ABC-CGF simple harmonies. It is very hard for them to hear the beauty in their own traditions unless they grew up hearing this music or having a sense of the larger traditions around it. In the countryside young people often still enjoy traditional music and often know someone who performs it. It’s played on the radio a lot, both here and in Taiwan. There’s a lot of pressure in mainland China—but not in Taiwan—to make the music more “accessible,” which means to Westernize it or to modify it in some way. This happening all over China. So they’re adding new instruments that don’t belong, speeding up the rhythms, and acting things out—basically destroying the tradition. That’s happening all over now, which is quite sad. There’s a definite bias against traditional vocal production. Recently I watched a television broadcast of a singing competition. There were some really good traditional singers, but they weren’t chosen. The young women being trained now want to be really feminine and pretty, and they barely make any noise when they hit the clapper. Today I read a newspaper article about modernizing some opera form up north and how wonderful it was that they were putting in an electric organ. The changes are being instituted partly because there’s such pressure on the opera companies from the government. Bureaucrats in charge of the cultural sections make decisions on aesthetic matters that they’re just not qualified to make. When I was in Fuzhou just now, I had the most interesting experience I’ve had in China. Up on the mountain in Fuzhou is an organization called the Retired Staff Workers Propaganda Team. Every day from 2:30 to 5:00, between two and three hundred people hang out there by the temple for the most wonderful amateur performances of Fuzhou opera. It’s all very casual. There are rarely any costumes. The relationship between the participants and the singers is very fluid, as people might listen sometimes and then get up and sing. The whole thing is organized by and for the old people, though there were a few younger people involved as well, and the old people clearly love it. I love traditional opera. Every region has its own opera, but even within Fujian there is a lot of variety in the operas, stories and plays, instrumentation, and melodies. In general, Southern music is more lyrical and melodic than Beijing opera, which has a lot of percussion and clanging and bashing. The instrumentation is very interesting and uses different melodies played against each other or the same melody played by all the instruments but with slight variation. It’s kind of counterpunctual. The percussion is quite complex because the rhythmic structures are melodic, too. The plots are all about the social structures of old China. The marriage play is very Chinese. The production is extremely stylized. When it’s done well and the singers are good, it’s like motion under pressure, like ballet. Everything is done through slight and subtle gesture. The hand movements are important, so the hands are incredibly expressive. The clothing and the costumes are designed to accentuate that. Wonderful stylized characterizations, and very expressive faces. I love to go backstage and see the real actors before they put their makeup on, when they’re not on stage and they’re just normal people. You can see a wonderful transformation once they’re on stage. In the West we really respect a fascinating individual actor. Here often the makeup is so elaborate and mask-like that it really creates an anonymity. The actor melts in, and the character doesn’t stand out as much. He’s just one piece in an entire jigsaw of the play, the costume, the colors and textures. The characters are symbolic, like the character types in comedia del arte. Within those restrictions you have really fabulous actors and actresses who can load the character type with much more emotion than they could with more realistic interpretations of the characters. In China, theater has always been part of ritual, and ritual has a lot of theater in it. Traditionally, drama played an important part in Chinese culture. There are the traveling minstrel shows that go round from town to town, there’s the very casual erhu [Chinese violin] player with his cigarette dangling out of his mouth all the time. These groups have seen it all, they know their parts, and there’s a really wonderful, unpretentious social world you can see onstage.